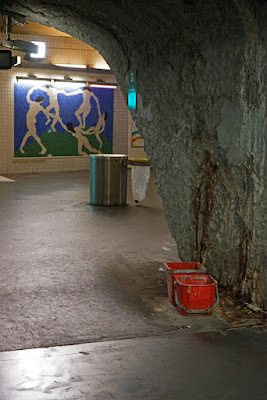 Auber station, just behind the Paris Opera, serves the RER (local railway): you can catch a train from here to Disneyland. However, there's little magic and sparkle on view. The gloomy lighting, dated styling, and general air of mild decay belie this station's history. 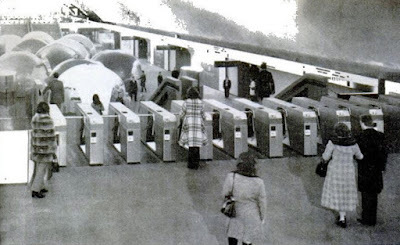 When it opened in 1971, it was one of the largest and most advanced underground stations in the world. 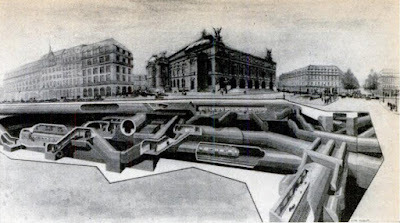 If such size seems excessive for a single railway line with a maximum of thirty trains an hour, it's partly because tunnels also link the RER station to another, Haussmann-Saint Lazare, as well as three nearby Metro stations, and the mainline Saint Lazare station. However, the train hall and ticket hall themselves are enormous: the train hall is 225 metres long and 24 metres wide. There are 73 escalators, 15 lifts, and 4 km of tunnels. I bought a ticket at a remarkable vending machine whose mini-computer does most of the thinking for harassed travellers. 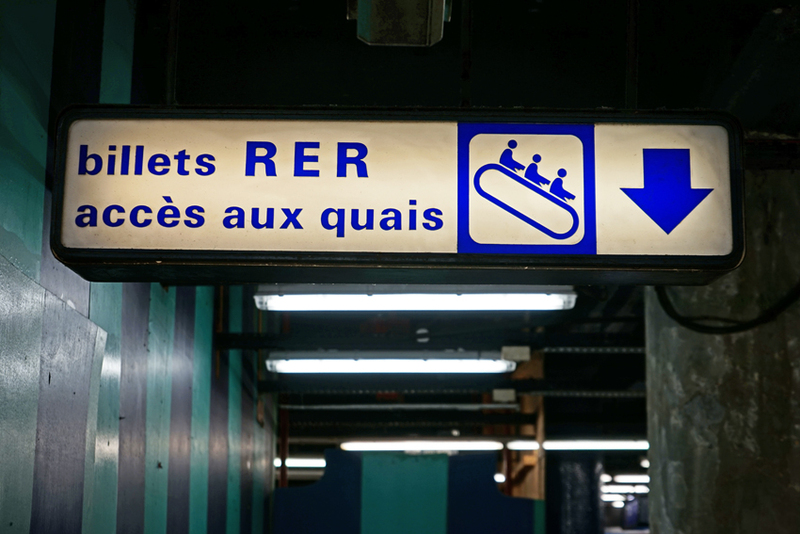 The RER network is pictorially represented with push-buttons; another 10-button row selects ticket categories - single, return, etc. 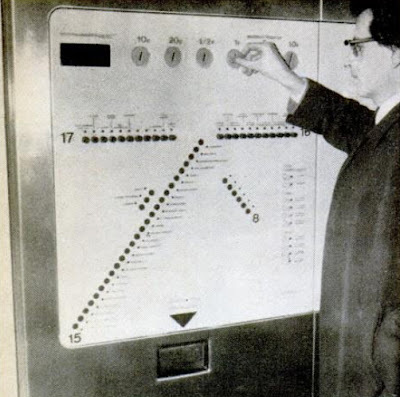 After you push two buttons, the mini-computer calculates the fare and displays it with electronic digital readouts. You then drop coins in the appropriate slots or insert a 10-franc note in a scanner. The machine prints your ticket on a blank card with magnetic coding carrying up to 60 bits of information. The interior didn't rely on its scale for effect. It also had some eye-catching features, particularly the 'igloo domes' which housed shops, a bank, and a travel agency. They are long gone, sadly. 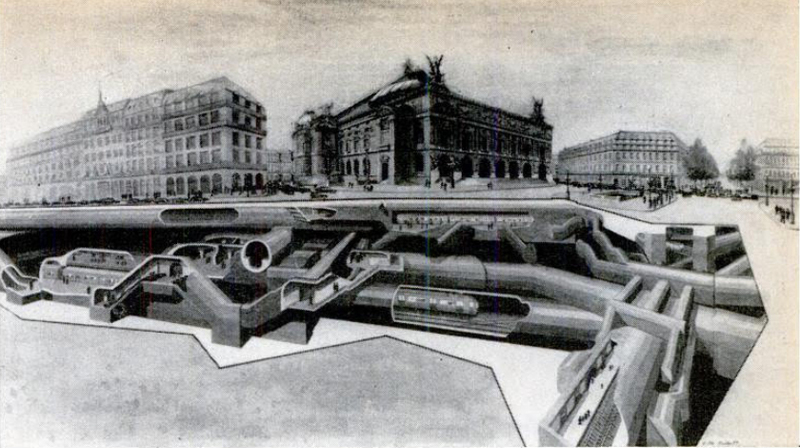 The difficulties of building such a large underground space below central Paris can be imagined. After all, sewers, a Metro line, the historical Opera building, and some of Paris' most prestigious department stores are immediately above. To make matters worse, the ground here is particularly wet - and indeed, it's water ingress which accounts for much of the dank, stained appearance of the station today. The station of the future has lost its shine. I was taking the RER to some rather more beautiful examples of innovative engineering: the former Menier Chocolate Factory at Noisiel, with its extraordinary mill. But the gloomy lighting and general air of mild decay are the fault of the RER. What has gone wrong, do you think? I think it's the usual reasons - lack of funding, lack of upkeep - combined with the physical difficulties of the location. Many of the problems are due to water ingress from the waterlogged ground it's built into. This is an off-topic query, but it seems to me that Caroline or readers of this blog might have an answer. It concerns a small village church in the Alpes-Maritimes. First, in a side chapel in this church there is a stone slab in the floor with a roughly engraved inscription: SEPVLCHRVM COMVNE PARVVLIS -- 'common grave for the poor little ones'. Picture here. Not sure whether this means 'poor little children' or simply 'poor folk', that is, a common grave for paupers. It seems odd to bury paupers *inside* a church, which would have involved hauling up the flagstone each time. Normally they would have been buried with a minimum of holy words in the corner of the churchyard, but possibly on a steep rocky slope in the Alps there was no such corner. Wondering about the date of 1722 -- was there some catastrophe like an avalanche which required a lot of people to be buried at once? Another odd thing in the church is a set of six possibly anthropomorphic hooks set into the wall, one in each of the symmetrical side chapels, four nearer the altar. Picture here. Although they have rough spikes on the top they are too close to the wall to be candle holders, and there is no soot staining above them. They don't look like ordinary coat hooks or pegs for men' hats removed for the service. What could they have been for? Sorry, I should have given the name of the church. It's Saint-Jacques le majeur in La Bolline, Valdeblore.